Every NFL head coach pays lip service to running the ball, but when Matt LaFleur says it’s a priority, we might actually take him at his word. Interesting maybe does that Bama back play into the Packers 1st round pick according to this article? if we take a running back in the first round with all the needs we have, i won't be happy. No you don't need a high pick back to make the system work.... you do need help on the OL. I think there are a couple of backs that can get the job done later. The other thing to look at is which OL guys fit the zone scheme. Some draftable options aren't as well suited as others. I’ve heard about 10 guys are top 5. Let’s wait and see. The Green Bay Packers have become too reliant on the talents of Aaron Rodgers over the last few years. Though former head coach Mike McCarthy could call a nicely designed play or two on occasion, his offense devolved into what was mostly a random grab bag of plays rather than a coherent system. And Rodgers’ distrust of the system became increasingly evident in his play and body language. There is no doubt that Rodgers is partly to blame for the Packers’ offensive woes in 2018. His tendency to freelance rather than making the easy play worked in the past, but this season he played out of structure far too often and the results were more negative than positive. The Rodgers era has been a bit of a disappointment — it is inevitably frustrating to have one of the most talented quarterbacks the league has ever seen win only one Super Bowl. New Packers head coach Matt LaFleur must get results from his team, and fast. Rodgers is 35 years old. He doesn’t have a lot of time left in the league and he certainly doesn’t have time to learn another system if his new head coach is a dud. Though his experience as Sean McVay’s only-in-title offensive coordinator with the Rams in 2017 helped him land a job as an actual offensive coordinator with play-calling duties for the Titans, LaFleur’s offense with the Titans looked more influenced by his time spent under Kyle Shanahan. (In 2015-16, Shanahan was Atlanta’s offensive coordinator and LaFleur was his quarterbacks coach). Shanahan and McVay’s systems have some differences in formations and personnel packages, but the common thread and impetus for both are the outside zone run scheme and play-action off of it. Perhaps the most important common denominator is how methodical and simple their systems are. In a league that is obsessed with using variance and volume to fool opposing defenses, McVay and Shanahan have found success with fewer concepts that build on each other rather than a large collection of concepts that don’t share a thread. Shanahan coached the number one offense in the league to a Super Bowl as the offensive coordinator of the Falcons in 2016 and last year, the 49ers finished 16th in total yards despite suffering from major injuries including losing starting quarterback Jimmy Garopollo early in the season. Even though everyone’s current memory of McVay is how he was trounced by the Patriots in the Super Bowl, his Rams finished in the top two in scoring the last two seasons. Both coaches have proven that this system can be wildly productive in the NFL and they did it without having a quarterback in the class of Rodgers at the helm like LaFleur now does. The hope is that LaFleur can install his iteration of their offenses and have the system work for Rodgers rather than having to rely on Rodgers to make it work. By cutting down on the volume of plays that the Packers run, LaFleur and his staff can spend more time coaching up the finer details of each concept. When players are comfortable with their assignments and no longer have to think about them, they will play faster and execute at a higher level. How do you stay unpredictable when your offense isn’t based on a high volume of plays? You have to create uncertainty for defenders within the first few seconds of the snap. Everything has to look the same — until it’s not. Last year, the Packers’ offense lacked attention to detail and the execution greatly suffered. The Packers’ run game menu in particular was oddly assembled. They ran too many different concepts. They were jacks of all trades but masters of none. According to Pro Football Focus, the Packers actually averaged 4.5 yards per carry running outside zone. 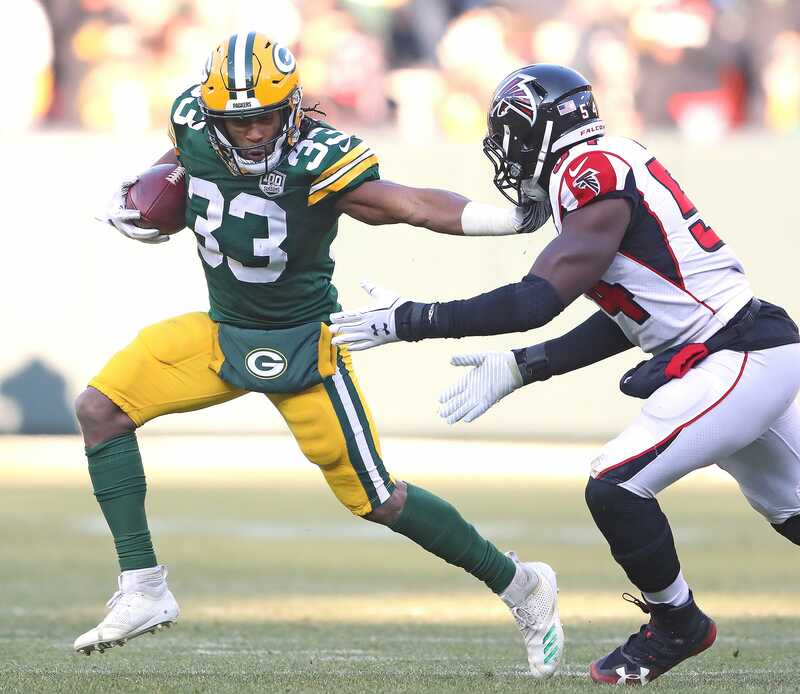 McCarthy seemed reluctant to give running back Aaron Jones consistent touches, even as Rodgers publicly stated he wanted the back more involved in the offense. Jones only averaged 11 carries in 12 games last year (he was hurt and had to leave the 12th game). Here, the Packers executed outside zone with a toss rather than a handoff. This variant helps get the back to the edge quicker and forces the defenses to flow faster. Like a regular stretch play though, the ball hardly bounces outside. Jones made his proper reads and cut the play back for a healthy six yard gain. However, there are some details that the Packers didn’t execute correctly that could have turned this into an explosive play. The offense had seven blockers for seven defenders in the box and didn’t have to leave anyone unblocked but tight end Jimmy Graham, who was on the backside of the play, left defensive end Cameron Wake (No. 91) unblocked and Wake made the tackle on Jones. Whether Wake was blocked or not, Rodgers should have carried out a fake to at least attempt to hold Wake for a second. Instead, he didn’t even bother to turn around after tossing the ball. Right tackle Bryan Bulaga is one of the most fundamentally sound linemen in the league but he should have ripped his back hand across the defender’s face rather than placing it outside. All of these details will be drilled into the players’ minds relentlessly by LaFleur and his staff. The Packers’ offense will make a total commitment to the outside zone. They will dedicate a lot of their practice time to perfecting outside zone blocking techniques, learning how to properly block it against any front, and adjusting it in different scenarios. LaFleur also has a few other complimentary runs that will go in the offense like inside zone, duo, or counter but they’ll likely run outside zone on about 50% of their runs. With the Titans, LaFleur varied his run concepts more because his personnel didn’t fit the outside zone scheme well. They had a big, power offensive line and were better at pushing people around on inside run concepts. Running back Derrick Henry was better at running north and south. LaFleur had to adjust and he did by calling more inside zone and Duo. With the Packers, LaFleur has an athletic offensive line with a lot of experience and they should be able to execute it at high level. An effective play action system will do wonders for any quarterback, but I’m excited to see how Rodgers performs if LaFleur can recreate the easy opportunities that McVay and Shanahan have schemed up for their own quarterbacks. Last year, the Packers only called play action on 16.6% of pass plays (30th the NFL). Play action off of outside zone is so effective because it forces the defense to flow hard in one direction and the run blocks and pass blocks are nearly indistinguishable from each other. There are mainly two type of play actions that come off of outside zone action; there is the standard naked boot leg with a three level flood concept and there is the half boot and shot play. With the naked boot, the backside end is left unblocked with the hopes that he’ll squeeze down with the offensive line flow and allow the quarterback to get outside the pocket. There is almost always a deep, intermediate, and short route in the pass concept. The deep route is usually an “Alert”, meaning a route that the quarterback will either decide to throw or not throw based on his pre-snap read. He might also peak at the Alert post snap. His first true progression is the flat route and then the intermediate route. McVay and LaFleur like to call their boots with a “Slam” route. In the clip above, tight end Jonnu Smith (No. 81) ran the Slam. Its purposes are to temporarily block the backside end and serve as an outlet. If the quarterback can go through all his progressions and get to the Slam route, it’s tough to cover because it’s in the area where the flat defenders would usually vacate to cover the first flat route. The spacing between the routes are vital and are major coaching points. Compare the spacing in the play above and in the play below, which the Packers ran last year (2018) in Week 16 against the Jets. There is no deep route to stretch the defense and Graham and Marquez Valdes-Scantling ran into the same area. They eventually separated but the spacing on this play was not ideal. Whether it was Graham or Valdes-Scantling at fault, this sort of mishap should not be happening in Week 16. Graham’s strengths are running down the seam and winning jump ball situations. LaFleur’s offense will require him to separate horizontally and run after the catch on boot plays. With his lack of run blocking, Graham might not be an ideal fit in LaFleur’s system. The shot play that has become a signature of the system is a deep post and deep crosser combination that has been called “Yankee” or “Burner”. The play initially looks like a boot play but a H-back or fullback will pull to block the end that is normally left unblocked on a naked boot. This allows the quarterback to set up the pocket and load up for a long throw. The post is his first option and the crosser is his second. In the play above, Titans QB Marcus Mariota finished his fake and saw that there were no defensive backs in the deep middle of the field. He threw the deep post with great anticipation. Rodgers should be able to unleash some beautiful bombs to Davante Adams while running this concept. If defensive backs start to play with inside leverage to defend the post, LeFleur can call another one of Shanahan’s signature plays: the Blaze Out. The primary receiver on this play fakes a post before breaking flat to the sideline. This is an extremely hard route to run but it’s absolutely lethal if you find a receiver who can run the route efficiently. On this play, cornerback Jalen Mills (No. 31) played a full two yards inside of receiver Corey Davis in anticipation of an inside breaking route. Davis’ wide split likely encouraged Mills to play further inside. Davis did a good job of keeping his speed on the out cut but he couldn’t flatten the route and drifted upfield. Mills slipped on the initial break but was close enough to hold Davis which prompted a flag. It was a decent route but there is definitely room for improvement. The best receiver that I’ve ever seen run a Blaze Out is Julio Jones. Shanahan installed the play during his time as Atlanta’s offensive coordinator and the Falcons kept it even after Shanahan left because it was so effective. It’s really a marvel to see a receiver as big as Jones run a route as violently and precisely as he runs it. Notice how much separation Jones got by flattening the route at the end. Adams is also a violent route runner and runs similar routes well. If he can perfect the Blaze Out, he’ll make cornerbacks miserable. When defenses start to get a bead on LaFleur’s play actions, he could call a slip screen off of the same action. Here, the initial action is almost identical to the Yankee concept. Mariota faked outside zone and the tight end pulled and blocked the end so Mariota could set up for what looked like a shot play. Instead, the offense had a slip screen set up to Henry, who slipped into the flats after faking the outside zone. This deceptive screen is hard on linebackers because their eyes and momentum are usually moving back to cover what they believe to be a play action shot play. These are the core concepts that LaFleur’s system will be built upon. He’ll have multiple ways of running them out of different formations and personnel packages. He’ll dress them up with exotic motions to add an element of unpredictability pre-snap, but the main source of creating uncertainty is in those first couple of seconds of the play when everything looks the same and the defense doesn’t know whether an outside zone, a boot, a shot play, or a screen is coming. One of the biggest differences in McVay and Shanahan’s offenses is their use of personnel. The Rams led the league in 11 personnel (1 back, 1 TE, 3 WRs) usage by a wide margin, while the 49ers led the league in 21 personnel (2 backs, 1 TE, 2 WR). Shanahan might have single-handedly saved the fullback from extinction with how he is using Kyle Juszczyk in his offense. Juszcsyk is like a Swiss army knife — he can effectively lead block but is athletic enough to split out like a wide receiver. As mentioned before, LaFleur is more influenced by Shanahan than McVay. He didn’t have a true full back in Tennessee so he made due by using tight ends in that position. Having a fullback changes the geometry of zone blocking for the offensive line because on one side, they don’t have to worry about getting to the second level if they know that the full back is responsible for the linebacker to that side. Here, the Titans ran an inside zone variation with Smith playing a fullback role. Smith was responsible for blocking the backside linebacker. Normally, on a regular zone play, the backside guard and tackle have to double team the defensive tackle to the linebacker but because Smith blocked that linebacker, the guard only had to worry about the defensive tackle to his side and the tackle only had to worry about the edge player to his side. So essentially, the blockers on the play side used zone principles, while the backside used man blocking principles. If he makes the roster, the Packers will have a true fullback on their hands: Danny Vitale. He was promoted from the practice squad in December and only played 19 snaps last year, but if he makes the roster this time, he should have a much bigger role in LaFleur’s offense as a lead blocker and pass catcher. Vitale had 1,427 yards receiving at Northwestern, so he is at least a capable receiver out of the backfield. Whether or not he can run routes will determine how creatively LaFleur will use him. This play is a play action off of the same run action as the inside zone with the lead block. As with many flood concepts, the fullback in the flat was Mariota’s first read. LaFleur’s arrival in Green Bay could be an awakening for Vitale’s career. Another principle of the Shanahan/ McVay/ Lafleur system is using bunch formations or stack alignments to force defenses to communicate and create natural “rubs”. In my film study, I noticed that LaFleur seems to have a larger menu of creative route combinations out of bunch formations than even his mentors. This double move concept from the bunch initially looks the same as a regular “Stick” concept in which the #1 receiver runs a speed out, while the #3 runs the stick route, however the #1 receiver pivoted back inside, while the #3 receiver faked a stick before going deep. The fake caused all-pro cornerback Stephon Gilmore to stop his feet, which created the little bit of separation that Mariota needed to get the ball over his head.The pivot route by the #1 receiver is called “China O” and is likely Mariota’s second read if the deep route was covered. Return and pivot routes are frequently used out in these offenses. Condensed formations could also be advantageous to run out of especially if the Packers could find receivers that could run block well. For the Rams, Cooper Kupp and Robert Woods blocked liked extra tight ends but were still threats in the passing game. If the Packers could simulate that versatility, LaFleur and Rodgers could play a cat-and-mouse game with the defense. If the defense has their nickel or dime personnel on the field, to defend the pass, the Packers could run the ball. If the defense has their base personnel on the field to defend the run, Rodgers could check into a pass. The Rams made a living off of this cat-and-mouse game with McVay sending in the audibles through the headset before communication was cut off when the play clock hit 15. Rodgers is intelligent and experienced enough to check into the right play without having to depend on LaFleur. Anyone can copy a playbook or system. They might have a little bit of success if the system is good but it takes a legitimate strategist to tailor a game plan in order to exploit an opponent’s specific weakness. LaFleur showed some of those capabilities last year with some brilliant scouting and clever play designing. In Week 11, before LaFleur’s Titans played them in Week 12, the Texans faced off against the Redskins. Against a double tight formation (single back with a tight end attached to both sides of the line), the Texans played a form of quarters coverage called “2-Read” to the strong side. The strong side safety and the cornerback keyed the tight end. If the tight end blocked, the safety would double team the outside receiver with the cornerback. This left only the outside linebacker to cover the tight end. However, it seemed the outside linebacker also had the green light to rush the passer if the tight end blocked. In the clip above, the outside linebacker Whitney Mercilus (No. 59) seemed like he was only in position to cover the tight end because he fell for the play fake and had to protect his gap. Mercilus hesitated like he was stuck in between rushing the passer or covering the tight end. He eventually decided to cover the tight end but was a hair late. LaFleur might have saw this play and other similar examples in his film study and designed a tactical counter from the same formation. Here, the Titans are in a double tight formation like the Redskins were in the week before. Mariota didn’t fake a run and instead dropped straight back, which invited Mercilus to rush upfield. Smith faked a block which seemed to help bait Mercilus. Again, in 2-Read, the safety and cornerback are reading the tight end. Safety Tyrann Mathieu saw Smith’s fake block and ran back to double the outside receiver — leaving no one to cover Smith. He snuck down the middle of the field and was so open that he was able to take a 7 yard pass and rumble for 56 yards after the catch all the way to pay dirt. LaFleur’s offense with the Titans was unsuccessful. They only scored 19.4 points a game (27th in the league), but they were bit hard by the injury bug. Mariota injured a nerve in his throwing hand that limited his range and velocity early in the season. Star tight end Delanie Walker broke his ankle in week 1 and missed the rest of the reason. The offensive line also had guys go in and out of the starting lineup. To top it off, the Titans just weren’t a great fit for the outside zone system. LaFleur will have a much better starting point with the Packers. He’ll have the best quarterback in the league and an offensive line that already has had some success with the outside zone scheme. Barring a second consecutive massive onset of bad injury luck, I believe LaFleur can turn the Packers’ offense around. But first and foremost on the list of vital tasks he needs to accomplish is getting Aaron Rodgers to buy into his system. The system is proven and Rodgers’ skillset is tailor-made to run it. If he trusts it, the Packers could flourish with LaFleur. "it is inevitably frustrating to have one of the most talented quarterbacks the league has ever seen win only one Super Bowl." the green bay packers have squandered the careers of two consecutive hall-of-fame quarterbacks.